This page will help to explain some of the erosion problems you may have and suggests various ideas to fix those problems. The shoreline of many lakes is constantly being bombarded by wave or ice movement, which grinds and displaces soil particles. This sedimentation, the settling of suspended particles, changes the lake ecosystem by covering plants and bottom habitat required for fish feeding and spawning. Sedimentation also carries nutrients and other pollutants that may be attached to the soil. Erosion of soil into a lake also causes the water to become turbid, or cloudy. Loss of water clarity makes feeding difficult for fish and wildlife species that rely on sight for pursuing their prey. Many property owners on developed shorelines have replaced native shoreline plants with turfgrass, which has a shorter root system. The short roots of the turf provide less protection against erosion and make the shoreline area more susceptible to wave and ice action. There are two primary types of materials that are found near the shoreline: consolidated and unconsolidated materials. Consolidated materials are basically bedrock and do not usually suffer from drastic erosion. Unconsolidated materials include sands, gravels and clays and are loosely bound and much more susceptible to erosion. There are three different groups of factors that cause erosion: terrestrial forces, aquatic forces and human activities. Slumping – The downward movement of a mass of unconsolidated material moving as a unit. Slumping is commonly caused by groundwater that exerts outward pressure on soil particles, creating a drainage area that can lead to soil movement. Soil creep – The gradual downhill movement of soil and loose rock material on a slope due to erosion caused by a combination of aquatic forces and gravity. Frost action – Generally occurs in poorly drained soils and may result in heaves or depressions in the land. Wind erosion – Can affect shorelines with fine and dry soil composition. Wind-breaking structures such as trees, shrubs, sedges and grasses can reduce the effects of wind erosion. Splash – Occurs when an area of exposed soil experiences direct precipitation. Heavy storm events can cause a significant amount of soil to be disturbed. Steeper slopes are subject to more intense erosion. Sheet erosion – Caused by the flow of storm water over the surface of an area. This movement of water removes “sheets” or thin layers of surface soil. The intensity of this type of erosion varies with the depth and velocity of the water movement, as well as the size and degree of which the land slopes. Rilling – The removal of soil in small, well-defined channels as a result of overland water build-up. Rilling is the most common process of rainfall erosion losses. Steep slopes and unconsolidated materials are most susceptible to rilling. Gullying – The removal of soil by larger diameter stream channels formed as a result of stormwater runoff. Gullying does not necessarily cause more erosion than rilling, but it can be more challenging to reverse as energy is channeled into specific areas or gullies. 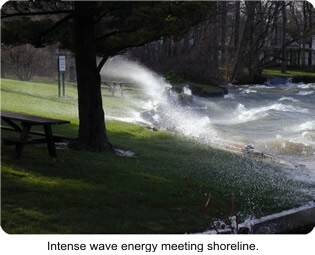 Wave action – The impact of waves hitting directly on an area of unprotected soil. Wave action may be natural or created by boat wake. Waves vary in velocity and frequency depending on water depth, surface water area and wind. 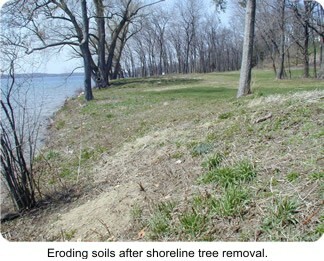 To evaluate the effects of wave action one must consider shoreline slope, vegetation and soil composition. Longshore drift – Occurs when waves impact the shore at an angle, displacing unconsolidated shoreline materials and moving them along the shoreline. This natural process is responsible for beach formation and important for beach resupply. The effects can be worsened by structures that deflect wave energy, causing more intense erosion for unprotected areas. Ice push – As frozen water from the lake melts in the spring it tends to push or lift objects, especially with rising water levels and high winds. 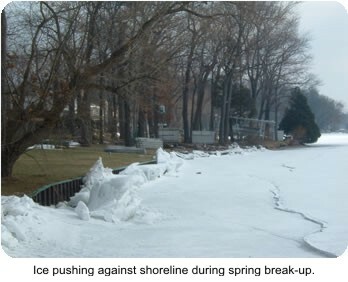 Many times ice is pushed up onto the shoreline in blocks or sheets which pile up and cause erosion. Level control structures – May raise lake levels to an unnatural point on the shoreline where soils are less able to withstand wave and ice action. Clear-cutting natural vegetation – The removal of vegetation by landowners to maximize the amount of visibility and access to the water. In addition to destroying wildlife habitat, the clear-cutting of natural vegetation also eliminates the erosion-preventing root structures once provided by native plants, trees and shrubs.